Champagne is one of the most famous and most admired alcoholic beverages in the world. Champagne is associated with all types of celebrations. Hence, a lot of people want to know about champagne facts and champagne brands. The history of champagne itself is quite interesting. It is normally believed that the French invented champagne first in the seventeenth century by a monk, Dom Perignon. The experiments to make champagne by the saint, Dom Pierre Perignon, were done with the help of the house of Moet et Chandon or M&C. Moet bought the rights to use the name Dom Perignon from Mercier. It is not quite clear whether the saint was the actual inventor of champagne though the myth had been carefully nurtured by the house of Moet. However, the contributions of the saint to the making of champagne are immense. Dom Perignon was the one to suggest that the grapes should not be harvested on the first day of summer but on a later date. The harvesting of grapes for champagne is done in September even now. He further said that the grapes should be pressed gently to get the best quality champagne. He also introduced the practice of pressing the grapes in three stages but the third stage of pressing had been banned at present. Another contribution to champagne making by Dom Perignon was the idea that different types of grapes should be mixed for high quality champagne. As such, most of the champagnes prepared today are a combination of grapes of Pinot Noir, Chardonnay, and Pinot Meunier. On the other hand, a few historians believe that the production of sparkling wine through a second fermentation, which is an equivalent of champagne, was done in 1662 itself by Christopher Merret in England. This is supported by the recordings of Sir George Etheredge in 1676 about sparkling wine preparation. Another version of the making of sparkling wine in champagne facts had been documented in 1531, stating the monks of St. Hilaire in Southern France used this second fermentation method. However, the regulation imposed in France in 1600 that wine and other alcoholic beverages must be transported only in vats and not in bottles created a problem for champagne, since champagne was filled up only in bottles. This ban was lifted in 1728 and champagne manufacturers started flourishing. The first champagne houses in France were Ruinart in 1729, Chanoine in 1730, Taittinger in 1734, Moet in 1743, Abele in 1757, Clicquot in 1772, and Heidsieck in 1785. Even though Gosset was established in 1584, it did not deliver champagne till the late eighteenth century. It is firmly held by champagne connoisseurs that champagne is of real quality only if it originates from the region of Champagne Ardenne. The main region is further divided into four other areas, namely, La montagne de Reims or Marne, mainly Pinot Noire, La Valee de la Marne or Marne et Aisne, La Cote des Blancs or Marne, mainly Chardonay, and La Cote des Bar or Aube near Troyes. Certain other organizations such as the Champagne Information Bureau or CIVC use three geographic areas for champagne production in the Ardenne region. The province of Aisne et la Seine et Marne or Aisne contains 2,053 hectares of vineyards, Aube et la Haute-Marne with 5,823 hectares, and Marne with 22,271 hectares of vineyards are the three areas, known as Aisne, Aube, and Marne. As such, Marne is the largest area containing champagne vineyards. Seven major champagne houses produce about 50% of the total global output of the various champagne brands, while another 5,000 companies supply the balance 50% of the other champagne brands. The seven champagne majors are LVMH group, consisting of Moet & Chandon, Veuve Clicquot, Krug, Ruinart, Dom Perignon, and Mercier, VRANKEN group of Vranken, Pommery, Demoisselle, and Heidsieck Monopole, MARNE group of Marne & Champagne, Lanson, and Besserat, Allied Domecq of Mumm and Perrier-Jouet, PERRIER of Laurent Perrier and Cast Lane, REMY COINTREAU of Piper Heidsieck, Charles Heidsieck, and BCC of Biozel and the Venoge Philliponat. In the United States, the LVMH group has a market share of 80% in champagne sales. The major champagne brands that have high reputation and excel in sales volumes are presented here in the order of their production volumes for persons who wish to know all the champagne facts. They are Moet & Chandon, Nicolas Feuillatte, Marne & Champagne, Mumm, Jacquart, Vranken, Veuve Clicquot, Laurent Perrier, Piper Heidsieck, Lanson, Pommery, Mercier, Charles Cazanove, Cast Lane, Canard Duchene, Taittinger, Louis Roederer, Perrier-Jouet, Bollinger, Dom Perignon, Pol Roger, and Krug. Champagnes are sensitive beverages. Excessive heat, exposure to sunlight or UV rays, or the hot atmosphere in a car can destroy the true taste and quality of good champagne. Champagne retains its best qualities when stored in temperatures between 7o and 12o in a horizontal storage position. Even the storage of champagne in refrigerators is likely to affect the quality of champagne due to the shaking created by the compressor. Basement climate cabinets are the best places to store champagne. The true champagne lovers adore every step of drinking champagne. These champagne facts should be understood by all those who want to consume champagne. They first inspect the labels to find out the information and genuineness about the champagne. The label contains the house from which the champagne had come, the type of champagne, the region in which it was produced, the percentage of alcohol, the size of the bottle, the name of the champagne, and the harvesting year. 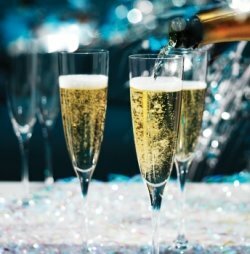 The next steps are the holding of the champagne glass and the pouring to ensure that it is poured slowly up to three-fourths of the glass without making it too bubbly. After that, the champagne is inspected visually and smelt with the nose. The tasting of the champagne follows by swallowing a tiny quantity that is swirled inside the mouth to savor its taste and flavor. Only if you follow all these etiquettes, you are accepted as a true champagne lover or connoisseur.